The simple phrase “in your eyes” immediately brings forth the chorus of a Peter Gabriel song. Almost simultaneously, I see an image of a young John Cusack (aka. 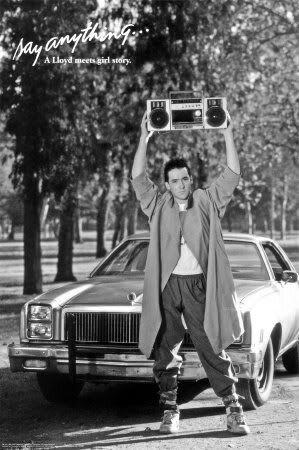 “Lloyd Dobler”) standing outside the window of his ex-girlfriend’s bedroom in the wee hours of the morning with a boom box overhead. In your eyes–the light, the heat. In your eyes–I am complete. In your eyes–I see the doorway. In your eyes–to a thousand churches. In your eyes–the resolution. In your eyes–of all the fruitless searches. My husband and I named our first son after this character in Say Anything. And the poster of that now iconic scene hangs in our 14 year old’s room–a recent gift from one of my old highschool friends–who was there when I first fell in love. “Love him?” she asked, with a smile. But unlike Lloyd Dobler and his heart throb, there were no sharp moments of pain for Casey and me. Our relationship unfolded easily without the dramatic edges of a coming-of-age romance. It was during my own highschool years, long before I met my husband, that I fell in love for the first time . And it was in “his” eyes that first I learned about passion and devotion and ecstasy. Shortly after I graduated however, my parents marriage ended, and then so did my relationship. Thus, it was a broken-hearted me and a much wiser one who fell in love with Casey. This made for a good choice in a mate as I can affirm over two decades later, but it also meant that I guarded my heart more closely. Until now. Last weekend, Casey made a surprise visit home from Kripalu where he is studying to be a yoga teacher in a month-long intensive. His was a short 18 hour stay, and our house was filled with company–but we found time to make love–and it was the first time–ever–that I looked into his eyes at that most tenderest of moments–fixing my gaze. Funny to think that there was still some of my heart left to give after so very long together. That’s beautiful Kel. You’re in love and it still makes me smile. Salasin and Deane….a very good thing. Kelly Salasin writes about long-term partnership from 30 years deep.